Despite some of the possible short comings of the utilization of PSA in the detection of prostate cancer, it is the general consensus of the PCAC members that PSA has been a positive and major development in the detection and management of early prostate cancer. Many prostate cancer experts believe the utilization of PSA in early detection of prostate cancer was a major factor in the decline of prostate cancer deaths in the United States over the past twenty plus years. Finally, in comparison to many cancer detection tests, PSA is a relatively inexpensive, widely available and low risk blood test for the patient. PCAC feels that the patient and their healthcare provider should have a discussion regarding the positive and negative aspects of the PSA blood test for detection of prostate cancer. All Floridian men 40 years or older should be directed by their health care professional to the PCAC website to review information regarding prostate cancer, the controversies surrounding screening and the risks and benefits of early detection. All Floridian men 50 years of age at average-risk for prostate cancer should be encouraged to undergo early detection testing after being provided with thorough information on the burden of the disease, the potential for better detection with newer tests that may decrease the rate of unnecessary biopsies and potentially better predict aggressive cancer. Men with limited life expectancy (less than 5-10 years) should be discouraged from routine prostate cancer screening. All Floridian African-American men and men with first and second degree relatives with prostate cancer 40 years or older who are at higher risk of prostate cancer should be encouraged to undergo early detection testing. 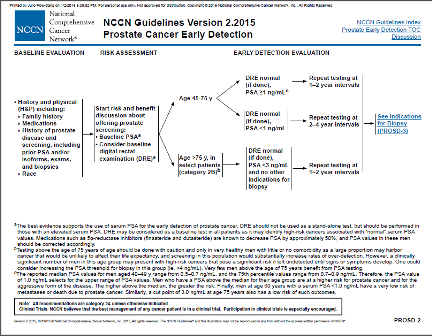 Early detection testing should include a PSA test, or newer markers (4K, Prostate Health Index [PHI] and digital rectal examination by their health care professional. All Floridian men undergoing early detection evaluation should be directed to the National Comprehensive Cancer Network (NCCN) website, www.nccn.org to follow up-to-date recommendations on early detection based on initial evaluation findings. High negative biopsy rate in men with PSA levels between 4 and 10 ng/ml. Urinary retention (inability to urinate). Infection with a 1-6% risk of serious generalized infection requiring intravenous antibiotics. Detecting non-life-threatening cancers and subjecting these men to unnecessary treatments with their associated risks and complications. Detecting early, life threatening cancers that may be cured with definitive treatment. How do we decrease the number of unnecessary biopsies and improve detection of life-threatening cancers? The controversies and science regarding early detection and screening of prostate cancer are continuing to evolve. PCAC’s recommendations represent the current consensuses of published scientific data, suggested prostate screening guidelines, and the opinions of the PCAC members. We encourage those who are interested in prostate cancer detection and screening to review the web sites we have listed. Our suggestions and the recommendations of others should help individual men make an informed decision on whether to proceed with prostate cancer screening, in addition, it is suggested that the patient should consult his primary care physician and/ or urologist to discuss prostate cancer screening issues. Prostate cancer becomes increasingly common with age, especially after age 50. Some cancers are called “clinically insignificant” meaning that they are not going to affect a man’s health or life expectancy. Some cancers may be progressive and lethal. There is not at present a test that can tell in the screening setting if a man has a clinically insignificant vs a lethal cancer. There is no screening test to tell clinically insignificant from life-threatening prostate cancers. Close to 50% of men diagnosed with prostate cancer with an elevated PSA have slowly progressive non-lethal prostate cancers, this is called OVERDIAGNOSIS. A PSA blood test is readily available and can easily be obtained through a simple uncomplicated blood test from the patient’s arm vein. While PSA screenings may help detect prostate cancer, it is not a highly sensitive or specific test. 80% of men who undergo a biopsy because of an elevated PSA may have a negative biopsy. In some cases, more than one biopsy session may be needed to rule out the diagnosis of prostate cancer. Many men undergo treatment of their non-lethal cancer, this is called OVERTREATMENT. Two international studies, one in Europe and one in the US reported that massive screening makes little impact in reducing mortality for prostate cancer benefiting only one in 45 men diagnosed with cancer and that overtreatment was a concern. This benefit was greater if men were screened between 55 to 65 years of age. Because of these findings, in 2012, the United States Preventive Task Force (USPSTF) advised against screening for prostate cancer with assignment of a Grade D recommendation. Moderate to high certainty that the service has no net benefit or that the harms outweigh the benefits. In 2018, the European Randomized Study of Screening for Prostate Cancer (ESPRC) determined the number needed to screen to prevent one prostate cancer death reduced from 979 to 781 based on longitudinal analysis of the study cohort. Additionally, the risk of metastasis reduced 30% in the screened group. Therefore, in response to the longitudinal data analysis out to 13 years, the USPSTF recommended a screening adjustment to Grade C for a limited population of men. The recommendation was for discussion of risk and benefits to screening in the 55-69 year old age group and individual decision-making. No risk adjustment was made for African Americans, males with significant family history of prostate cancer or for older healthy males. Close to 30,000 men die every year from prostate cancer making it the most common cause of cancer death in US men. Additionally, men with aggressive cancer could live years with serious side effects resulting from prostate cancer. Spread of prostate cancer (metastasis) can severely decrease the longevity of the patient as well as the quality of life of the patient and his family. Because of these observations, they recommend that men are given information regarding the risks vs benefits of screening and give men the chance to make an informed decision on whether they want to proceed with screening. Due to the significant controversies with screening for prostate cancer and evidence that, when appropriately used, judicious PSA testing may benefit men who harbor clinically significant prostate cancer, PCAC recommends that health care professionals direct men to the education resources available at the PCAC website where information may be found regarding the benefits and risk of screening and for health care providers to encourage men to undergo early detection testing as defined in the guideline statement. There are newer tests that are making early detection of significant cancers more accurate. These new tests address the concern of OVERDIAGNOSIS. There is evolving knowledge and testing to define clinically insignificant cancers. Men with these cancers may be managed by active surveillance. This knowledge is leading to a continuous decrease of OVERTREATMENT of non-lethal prostate cancer. The 2018 USPSTF recommendations for shared decision making for PSA screening in the 55-69 year-old age group more closely align with the American Urological Association (AUA) and most major physician group recommendations. Screening for prostate cancer is controversial. While the United States Preventive Services Task Force (USPSTF) recommends against screening, other organizations including the American Urological Association (AUA), American Cancer Society (ACS), National Comprehensive Cancer Network (NCCN) and American College of Physicians (ACP), recommend informing men of the risks and benefits of early detection. There are men at higher risk (African-Americans and men with a family history of first or second degree relatives with prostate cancer) of developing prostate cancer. Importantly, African- American men have a higher risk of mortality from prostate cancer. After this discussion, those men who want to be screened should be tested with the prostate-specific antigen (PSA) blood test. The digital rectal exam (DRE) may also be done as a part of screening. If, after this discussion, a man is unable to decide if testing is right for him, the screening decision can be made by the health care provider, who should take into account the patient’s general health preferences and values. Men who choose to be tested who have a PSA of less than 2.5 ng/mL may only need to be retested every 2 years. Screening should be done yearly for men whose PSA level is 2.5 ng/mL or higher.Even after a decision about testing has been made, the discussion about the pros and cons of testing should be repeated as new information about the benefits and risks of testing becomes available. Further discussions are also needed to take into account changes in the patient’s health, values, and preferences. Because prostate cancer often grows slowly, men without symptoms of prostate cancer who do not have a 10-year life expectancy should not be offered testing since they are not likely to benefit. Overall health status, and not age alone, is important when making decisions about screening. Even after a decision about testing has been made, the discussion about the pros and cons of testing should be repeated as new information about the benefits and risks of testing becomes available. Further discussions are also needed to take into account changes in the patient’s health, values, and preferences. The Clinical Guidelines Committee of the American College of Physicians (ACP) developed these guidelines. ACP is a professional organization for internal medicine doctors, who are specialists in adult care. Prostate cancer is the most commonly diagnosed nonskin cancer among men in the United States. The most common prostate cancer symptoms are difficult or frequent urination, but many men have no symptoms. A blood test that measures prostate-specific antigen (PSA) levels can find prostate cancer before symptoms develop. If the PSA level is high, a prostate biopsy may be needed to see whether cancer is actually present. A biopsy is a procedure that is done to obtain a piece of the prostate for examination. Most prostate cancer grows slowly, and many men with prostate cancer die of something other than prostate cancer. Currently, there is no way to know which cases of prostate cancer are life-threatening and require treatment and which cases are not. When screening identifies cancer that is not life-threatening, men experience unnecessary worry and complications from treatment. Common complications include urinary incontinence and erectile dysfunction. Organizations have guidelines for prostate cancer screening that provide different and conflicting advice. ACP evaluated available guidelines to help doctors and patients make better decisions. The National Guideline Clearinghouse (NGC) is a database developed by the U.S. government to make clinical guidelines widely available. 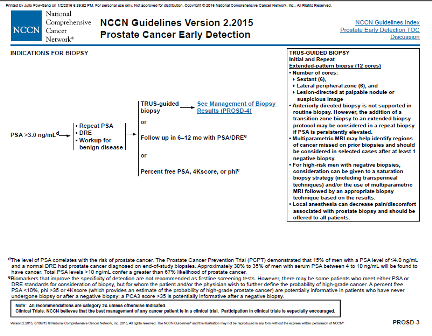 The authors searched the database for U.S. guidelines about prostate cancer screening with PSA. 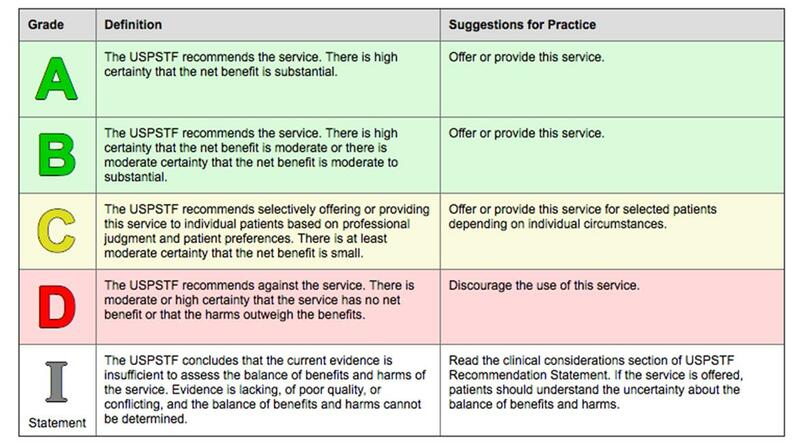 They evaluated each guideline using a published instrument that considers 23 standard criteria for the quality of guidelines and rated each guideline from 1 (worst) to 7 (best). The authors found 4 guidelines: American College of Preventive Medicine, 2008 (rating of 3); American Cancer Society, 2010 (rating of 5); American Urological Association, 2009 (rating of 3); and the U.S. Preventive Services Task Force, 2012 (rating of 6). They conclude that PSA is not just a blood test. It can open the door to more testing and treatment that a man may not want or that may harm him. Because chances of being harmed are greater than chances of benefiting, each man should have the opportunity to decide for himself whether to be screened. Doctors should inform men aged 50 to 69 years about the limited potential benefits and substantial potential harms of prostate cancer screening. Patients and doctors should base screening decisions on the patient’s preferences, prostate cancer risk, health, and life expectancy. Doctors should not screen for prostate cancer using PSA unless patients express a clear preference for screening after discussion. Doctors should not screen using PSA in average-risk men younger than 50 years or older than 69 years, or any man with a life expectancy less than 10 to 15 years. These recommendations apply to men at average risk for prostate cancer who do not have symptoms that could be caused by prostate cancer. The authors did not consider non-U.S. guidelines.